You are here: Home / Coca-Cola Campaign / Follow the ride live! Last night, just before packing it in for the day, my iPhone made the noise of money falling on a table – the JustGiving App on the iPhone is really quite good – this was significant because a very generous friend and ColaLife supporter had just donated the amount of money I needed to reach my target of £1,500. I find this fundraising lark really quite difficult and I’m really grateful to all those who have responded to my pleading emails and put their hands in their pockets and/or sent kind tweets, written a blog post or whatever. I don’t take your support for granted and you will see the results of your support unfolding here. It’s also good to make things fun if you can. So, I’ve set up The ColaLife Participation Ride 2010 Blog! 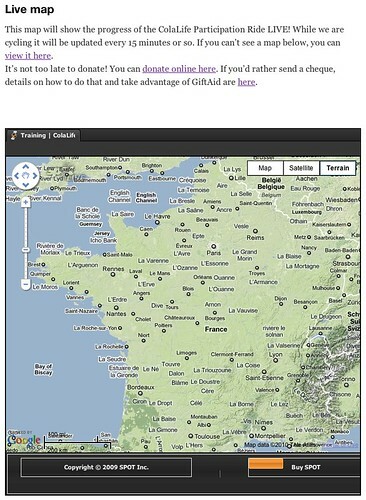 The url is aidpod.org (for obvious reasons) and it features a LIVE map. While we are cycling this map will be updated every 15 minutes or so. I will also be blogging from the saddle, WiFi access permitting, so supporters will be able to participate in a lot of the excitment with none of the pain.